Last week, the accidental death of Rei left me feeling decidedly cold. Even though trains have been an omnipresent aspect of the show’s aesthetic (as commenter Ami mentioned), it was still such a contrivance, such a forced bit of emotion, such a odd bit of punishment, that it rang very hollow as an emotional moment for the series. Despite all that, “Ablution” and “A Beach of Dreams” manage to bring emotion forward in ways that Rei’s actual death could not. “Ablution,” in particular, had me on the verge of tears. (You know how when they well up in your eyes but refuse to trickle down your face? That.) It may be shamelessly manipulative in its execution—the taking aside of Karou after practice, the too-late delivery of the roses to Miya-sama, Tomoko waiting for Nanako at the station—but that doesn’t mean it’s not incredibly effective. But it’s a small moment, when “Ablution” takes advantage of its medium, that ultimately seals the deal for me. I’ve written off and on about the show’s use of limited animation or Osamu Dezaki’s trademark pastel freeze frames as ways for the show to heighten an emotional moment, using the budget-saving aspects as a strength instead of a weakness and embracing those aspects of anime as stylistic flourishes. 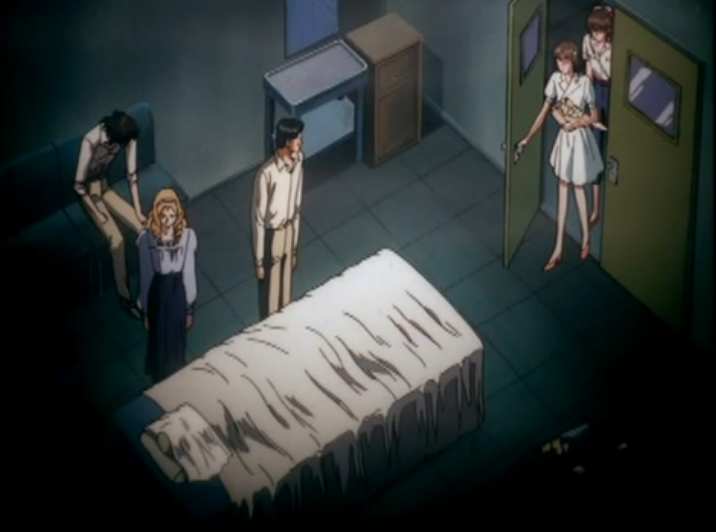 As Nanako and Tomoko walk to the viewing room in the basement of basements, the animation emphasizes the dreamlike quality by skipping some of the in-betweening. The girls move forward not at a walk but in a more ethereal way, with some of their motions lingering on screen despite the fact that they’re not there any longer. It’s the perfect visual representation of whole situation, the denial that Nanako is going through in thinking that she’s dreaming all of this. “A Beach of Dreams” is a little less impressionistic in this sense, but still offers those emotional moments. Nanako’s selection of the doll as a memento carries all the weight you would expect, but it’s really Miya-sama’s episode. Her breakdown in the funeral (nicely complimented by Takashi’s desire to give his sister space to mourn) is gut-wrenching and the solid button for the character’s arc over the course of the series from cold and cruel (and borderline sociopathic) to a woman who realizes how to really achieve her dignity. I’m not convinced it excuses her cruelty toward Rei, especially since she knew that they were full sisters, but Rei had moved on from it, and I suppose that’s enough. But questions and plots linger. Kaoru, who so wonderfully is unable to help Nanako at the arcade (how heart-tugging was that? ), still has her mystery medical malady and her connection to Hemi that needs resolving. I can only assume that the four remaining episodes will deal with exactly that plot. We’re closing in on the home stretch of Oniisama e…, so I wanted to get the gears churning about what’s next. There’s two weeks of coverage left, which will close out my things in mid-December (if I’m doing the math right). After that, I plan to take two weeks off, and then starting on Jan. 1, 2013, I’ll devote a month’s worth of coverage to the original Astro Boy, in honor of the show’s 50th anniversary. In addition to the episode reviews, I’m going to read Fred Ladd’s Astro Boy and Anime Comes to the Americas and Frederik L. Schodt’s The Astro Boy Essays. Feel free to read along with me, but I want your input about which seven episodes to cover over the course of January (the first episode is a no-brainer). I’ve seen a small chunk of the series a number of years ago, but not all of it, so I want some assistance. You can offer terrible episodes, interesting episodes, favorite episodes, whatever. I just want some suggestions.